Your baby’s blood circulation contains millions of stem cells. After the umbilical cord has been cut, the remaining blood in the umbilical cord is still rich in stem cells. The valuable blood can be collected by puncturing the umbilical vein. The collection is simple, safe, painless, and without any risk for mother and child. After collection the stem cells are processed in our lab and frozen in liquid nitrogen. The stem cells will not age and their unique characteristics will be preserved for decades in this frozen state. Umbilical cord blood has enormous potential. The stored stem cells will be available throughout life and may support repair processes at any age. Stem cells from the umbilical cord blood are unique. Your own stem cells will naturally match your tissue characteristics perfectly. They are as unique as the fingerprint and as individual as the personality. Stem cells from the umbilical cord blood are young. Neonatal stem cells are not yet impaired by age or environment. They are unpolluted, viable and divide at a fast rate. Stem cells from the umbilical cord blood are flexible. Thanks to their great differentiation potential they can develop into a variety of cell types. Stem cells develop into e.g. new blood cells, cells of the immune system and the body’s organs. The umbilical cord blood of a newborn contains innumerable busy, potent, and viable stem cells. Over nine months, they develop into a new human being from just one small cell. Throughout life they will support the repair mechanisms in his or her body. Many researchers regard stem cells as the source material that could soon be used to fight diseases, which have been hardly curable so far. A smart investment in the health of your child may therefore be storing the umbilical cord blood. When storing your child’s stem cells with Vita 34, you can be certain that the stem cells will be available for life as a precautionary measure in case your child should need them for treatment. Vita 34 is the most experienced stem cell bank in the Nordic countries and your competent partner in storing umbilical cord blood and tissue. We have developed reliable processes and safe materials for storage so that the stem cells are available in top quality even after many years. The umbilical cord is the lifeline between mother and child. It contains three blood vessels, through which the umbilical cord blood pulses and exchanges oxygen, nutrients and waste products with the placenta. For the blood vessels to withstand the stress and not to bend, they are covered by umbilical cord tissue to protect and support the cord. The umbilical cord tissue contains a gel-like substance called Wharton’s Jelly in which a large number of mesenchymal stem cells are found. The mesenchymal stem cells are particularly interesting to stem cell therapy. By storing umbilical cord blood and umbilical cord tissue, you therefore get double the stem cell power. The potential of stem cells from the umbilical cord blood and umbilical cord tissue in treatment of diseases is enormous. Scientists expect ground-breaking findings and developments in the field of stem cell therapy in the coming years. Vita 34 is continuously working on enhancing the application possibilities of umbilical cord blood. In collaboration with renowned universities and research institutions, Vita 34 is investigating new therapeutic options regarding the treatment of stroke, heart attack, hematopoietic diseases and type 1-diabetes. Why umbilical cord blood in stead of bone marrow? The success of stem cell therapies depends largely on the age of the transplanted cells. 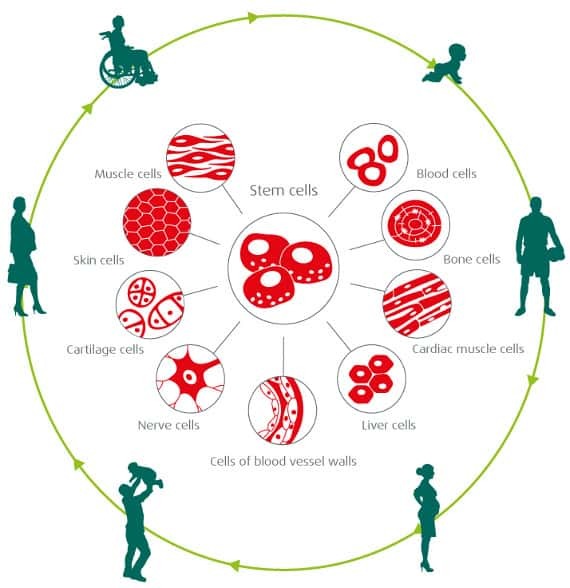 Stem cells inside our bodies age with us and may be damaged by diseases and environmental influences. The younger they are the better they can adapt and regenerate. Recent research shows that certain age-related diseases like arteriosclerosis occur only when the stem cells have become too old. With age they are merely able to divide and stimulate regeneration, which results in damages not being repaired anymore – or only at a very slow rate. That is the reason why physicians prefer the young stem cells from the umbilical cord for medical treatment. The Collection process holds no risk or disturbance for mother and child." Collection of umbilical stem cells is uncomplicated. When you plan to leave for the place of the birth, you will call the Vita 34 Hotline. 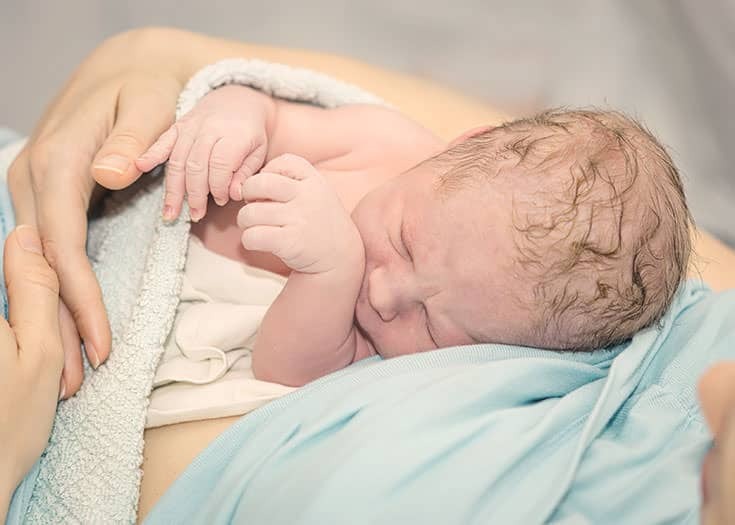 Our midwife on call will arrive at the birth at a time agreed with you. She will stay in the background as to not disturb you. As soon as the baby has been born and the umbilical cord has been cut she will collect the cord blood and possibly the cord tissue. The process holds no risk or disturbance for mother and child. The collection of stem cells is transported under safe conditions to our laboratory in Leipzig, Germany. In a few hours the collection will be processed, analyzed and frozen by our competent laboratory staff. At last it will be frozen to minus 180 degrees celcius and transferred to our safely monitored storage tanks, where they will be kept in liquid nitrogen for the years to come. The stem cells are a unique reserve kept ready in case they should ever be needed. Even today, stem cells from the umbilical cord blood are used as standard treatment of hematopoietic disorders like leukemia or anemia. They help correct and regenerate the immune system. After massive chemotherapy, cord blood stem cells help stimulate the formation of new blood cells. The possibilities of application are even wider though: Stem cells from the umbilical cord blood have already been applied in individual treatments, medical and clinical trials, clinical studies regarding autoimmune diseases (e.g. diabetes type I), heart diseases, neurological damage (e.g. infantile brain damage) and acquired hearing loss. Scientists expect that in the future, stem cell therapy may be an option in relieving the consequential damages of heart attack and stroke or in treating degenerative diseases of bones, connective tissue, and joints. Related research projects with promising results are already being conducted.